Anyone who reads my blog knows that Robert Tonner’s dolls hold a special place in my heart. I discovered Tonner’s dolls in 2003, when Tyler Wentworth and her world reigned supreme in Robert’s offerings. I was primarily enticed by the dolls’ uber-realistic, beautiful faces. They were so full of personality, and each one was distinct from the others. I loved that Robert injected racial diversity in his collections, regularly adding gorgeous African-American, Asian, and Hispanic characters into the mix. Today, I have hundreds of dolls from Tyler’s world in my collection, and they remain first in my heart. But, of course, doll lines have short shelf lives in the world of high-end fashion dolls, and Tyler and her world were gradually phased out as collectors’ tastes changed. Tonner went on to create other doll lines. Cami, Re-imagination, DeeAnna, Antoinette, and Deja Vu took their turns in the spotlight, and many were gorgeous dolls. But while I purchased several of these dolls, none grabbed my attention like Tyler and Sydney once did. Back in those days, it was difficult for me to winnow down the list of dolls I wanted to purchase in each subsequent line unveiling. Like many collectors, I’d count down the days until Tonner’s latest unveiling, quickly emailing my dealer my wish list in hopes of getting to her first before my favorites sold out. But with Tonner’s subsequent lines, there were usually only a couple that stood out to me, and they rarely sold out. It could be that I’m romanticizing my early collecting days, and the Wentworth family is a source of wistful nostalgia. It could be that I’ve matured as a collector, and I am now choosier with what I add to my collection. After all, I have to be out of necessity. My collection is bursting at the seams of my many doll cabinets. “Once upon a time, in a far off corner of a very southern part of France, lies a tiny village called, Faire Croire. Don’t bother to look on any map, you’ll never find it. It’s a lovely village where the people enjoy a life of beauty and peace. Every house in the village is a different color and has window boxes filled with flowers of all kinds. The moss covered thatched roofs slant in all angles. There are no locks on any doors or windows. The narrow cobblestone streets are lined with fragrant flowers growing in beautiful pots adorned in jewels. The air is always thick with the scent of freshly baked pain au chocolat. It seems like a place you would hear about in a fairy tale. Although Faire Croire is well over 500 years old, no one knows it’s there. But, Faire Croire does have a quality, something sinister that hangs over the heads of all the villagers. Something like a dark cloud. Could that feeling be coming from the castle on the hill? I love Tonner’s quirky back stories, and I hope he expands on this one. Miette’s aesthetic is full of pastel colors, ruffles, and eyelet fabric. Her face is open and innocent, her lips ever-so-slightly parted as if she might speak. She reminds me a great deal of one of my other favorite sculpts of Robert’s, Euphemia, one of Cinderella’s wicked stepsisters. But while Euphemia is pouty and cross, Miette is sweet and tender. It seems that I am not the only collector enchanted by Miette. She was just released yesterday, and the status of many dolls has gone from “in stock” to “coming soon,” which I assume means they have sold out of much of their first shipment. While I’m delighted for Tonner Doll, as I can’t remember this happening for some time, I’m disappointed that I wasn’t able to place my order today. I’m going to start out with a raven basic, and if she is as lovely as her pictures, I’ll likely add a dressed doll. If money were no object, my wish list would consist of the Raven Basic, Dainty Miette, Fanciful, and Enchanting Miette. 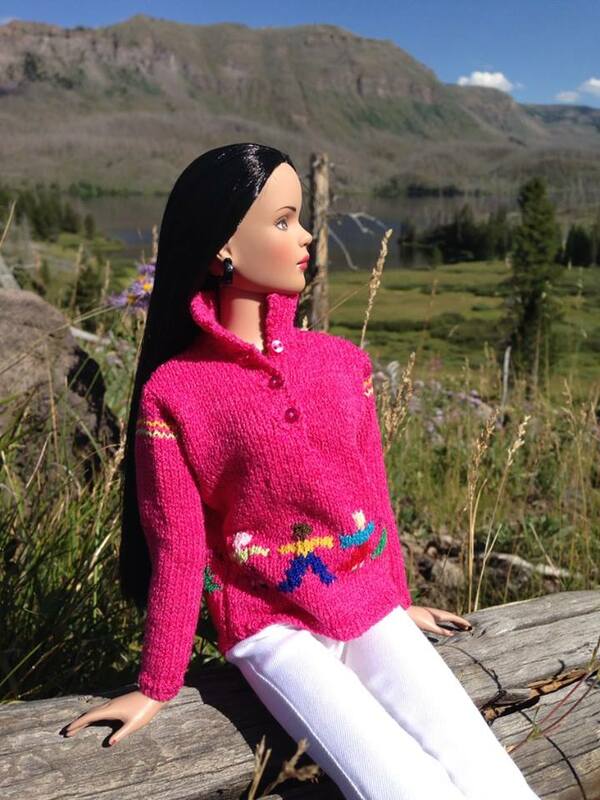 I wish Tonner the best with this new line, and I’m looking forward to adding Miette to my dolly world. Who knows, perhaps she will fill the empty place in my heart that Tyler left when she exited the scene. I love this doll, and have bought the basic with raven hair. I will also have the one with red hair. They are beautiful dolls, with a georgeus outfit. I nearly ordered the basic Raven but was distracted by the flame-haired dressed doll. I was thinking of the outfits as possibilities for Marley who has the same body type but are these too fanciful and ‘young’ for Marley’s character? Raven Basic is calling my name. Sheeeeeryl! Sheeeeryl! See? This line is gorgeous. I love the hand-painted details, the hair and the outfits. Also, I love the story. I just love a story to go with the doll!